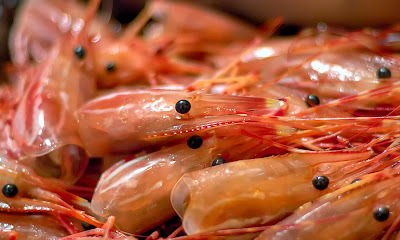 Diners snap off the heads, slip the shells from the fresh pink shrimp and pop them in their mouths. Like eating popcorn, it's hard to stop. Some people like cocktail sauce for dipping the shrimp, but I feel that the sauce obscures the flavor of the shrimp so usually we just eat them plain with a little lemon juice squeezed over them. Beer is the traditional beverage pairing, but white wine works well too. Serves 2 - 4, depending on appetites! Bring the water to a boil and add the salt, bay leaves, peppercorns, coriander seed, mustard seed, dill seed, cloves, pepper flakes and wine. Halve one of the lemons, squeeze the juice into the water and then drop the lemon halves in. Simmer the water ten minutes to develop the flavor, then raise to a boil and dump in the shrimp and cook, stirring, two minutes -- no more -- and immediately drain in a colander. Rinse briefly with cold water, drain, and serve with lemon wedges, a big bowl for the shells, and plenty of napkins.